Every year or so, we review park Rules & Regulations and make changes as needed. Part of the process is soliciting feedback from you on proposed changes. We would like to share with you the proposed changes for this year, and let you know how you can comment and give us feedback. The main rule change for this year is a proposal to designate smoke-free zones at playgrounds and some busy day use areas in the parks. This is in direct response from requests from park visitors, and known health concerns.Smoking would still be permitted elsewhere in the parks, except for these specifically designated areas. 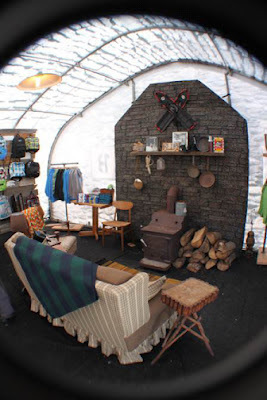 Are you looking for outdoor adventures for your family but aren’t quite sure about taking on the adventure by yourself or would you like to add something new to your outdoor experience? Join us for the 15th annual Becoming an Outdoor Family Weekend – June 1-3, 2012! You’ll join many other families taking part in workshops presented by expert instructors providing basic hands on experience for a variety of topics including outdoor cooking, GPS skills, wildlife photography, kayaking, kite making, making jam & jellies from wild Vermont fruit, fishing,building rustic furniture, birding by ear, trail running, mountain biking, lots of family time, and much much more. There are over 50 workshops to choose from and something for every age group is sure to be found. Some families have been joining us for over 10 years and for many this will be their first year camping with us. Here at Vermont State Parks, we often get requests for information about our parks. Recently Courtney from Michigan contacted us for information about our parks for a school report on Vermont. 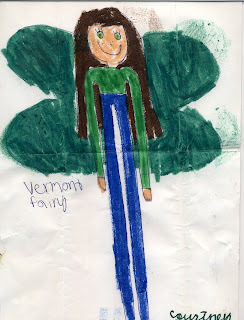 We love speaking with students about everything Vermont State Parks has to offer, and we were even more thrilled when we received a drawing and note from her this week! Thanks Courtney for the beautiful drawing and note! We like fairies too and we especially love that she is wearing Vermont State Parks colors! Spring is here which means warmer weather and bright sunshine! This is the perfect time to get outside and explore Vermont State Parks! You may be familiar with some of our popular and busier parks, but do you know about the quieter spots off the beaten path? 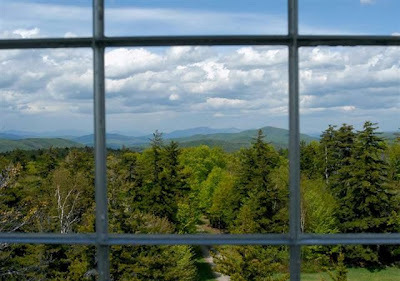 When you need a quiet afternoon away from it all, Vermont State Parks has hidden spots away from crowds. Whether you want to sit back with a book along a stream, take a stroll on a grassy trail, or have a quiet picnic we have parks that provide a relaxing setting for those who want to take it easy for the day. Are You Ready for Adventure? Venture Vermont 2012 is Here! It's that time of year again and Venture Vermont is back! That means it's time to get ready for exciting adventures in Vermont State Parks this year. This year's Venture Vermont Outdoor Challenge just started on April 1st and the challenges are better than ever this year! When you reach 250 points, all you have to do is send us your score sheet along with your photos and you will receive a VIP Gold Coin, good for free park entry for the rest of 2011 and all of 2012! You will also have the chance to tackle some weekly bonus challenges that you can add to your scorecard, these will be posted on the Venture Vermont Page instead of Facebook this year. Check back often so you don't miss the bonus challenges as they change weekly!